News, updates and info for the fire protection and security industry. At S&S Sprinkler, we consider ourselves a lot more than mere coworkers. Our family is a team — a team who strives to be professionally, personally, and civically successful. Working effectively as part of a team is extremely important when it comes to outputting quality work. Our main concern is keeping you safe, and our team, consisting of people who rely on, trust in, and learn from one another, ensures that this goal is accomplished. Teamwork also keeps us motivated and boosts our morale as a company. When we’ve finished a job together that helps our community and our family of clients, our confidence grows — both in ourselves and in one another. We all have a common goal, and we love getting there together. We have pledged to work as a team and to live by our 6 core values, not just to grow as a business, but to become better people. 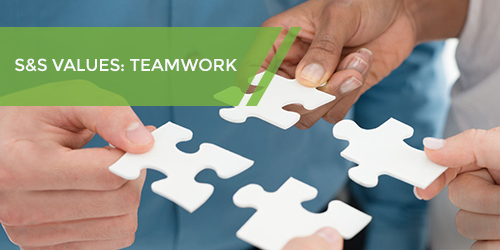 We encourage you to incorporate the value of teamwork into your daily lives, whether it’s at home or at the workplace. We are always excited about working together to keep you and your family or company safe. Take a look at all of our values, and contact S&S to see how we can keep your business protected.